Can you spot the hidden word? I loooooove Francis Bacon, one of my favorite painters of all time! Of course, Serrano’s photograph could be interpreted several different ways but I find the obsession with the body and blood (in terms of “eating and drinking” it) very peculiar. It can also be considered as a representation of the way Christians exploit the death of Christ for their own benefit. But, I guess they kind of have to because it is the very foundation on which their system of faith is built. Hey, this is actually a good topic. Why is it that Christian art, at least in the form of literature, is so much more profound and enduring than its secular counterpart? Compare, for instance, Dostoevksy, Dante, and Hugo, to Graham Greene, Bukowski, and Vonnegut. And perhaps in painting we could say the same: Oh Atheism: where is your Michelangelo? Or Again, in Music: Compare Rachmaninov’s Vespers to Lady Gaga’s Poker Face. Only a philistine would choose the latter. That’s the point: atheism has no narrative that could compete with the Christian narrative in terms sublimity and profundity. Even today some of the most accessible composers are writing ‘spiritual’ music: Part, Gorecki, etc. ‘This two are totally comparable… *eyes roll out of head*”That’s the point: atheism has no narrative that could compete with the Christian narrative in terms sublimity and profundity. Consider, the Christians and other theists have a huge head start on us. 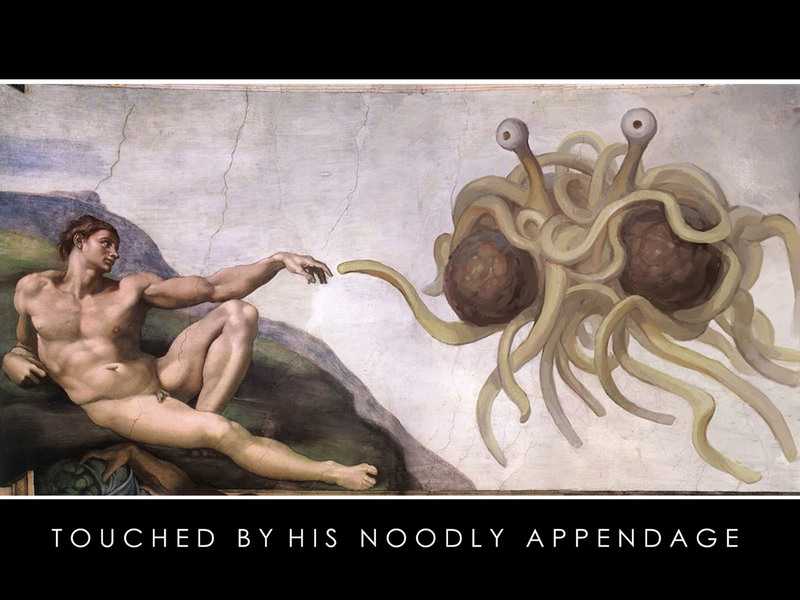 Back in Michelangelo’s time, atheism could get you killed! Plus for most of the Common Era, right up until the Enlightenment, the Church was the most powerful economic and political force in Europe. They sponsored massive works of public art. Until quite recently in terms of art history no one created a major piece of artwork outside the auspices of the church. Yes, just think of all those Christian novelists who have a had a more profound mark on American literature than Mark Twain and Hemmingway and Christian painters who have had a more profound mark on 20th century art than Pablo Picasso (a practicing Catholic who labeled himself an atheist) and Jackson Pollock. Also, Chaucer’s The Canterbury Tales, which rests as a foundational work of literature in English, contains in it prominent themes of religious hypocrisy, greed, and corruption. The idea that atheists and works of anti-religious art have played no role in the development of western art is simply ludicrous. (Galatians 6: 7:8): “Be not deceived, God is not mocked. For what things a man shall sow, those also shall he reap.